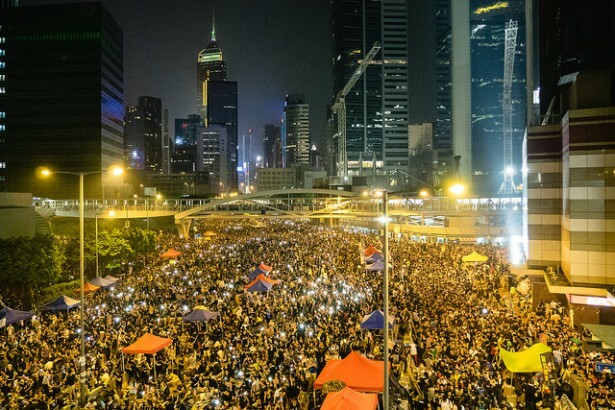 More than just a name, Occupy Central with Love and Peace was also the goal of an over year-long process to use nonviolent action to secure free elections. The protests in Hong Kong over the last couple weeks has blanketed the news. The sheer numbers of people in the streets may be spontaneous, but — like most movements that appear to “just happen” — there have been organizers working tirelessly to make such massive action possible. Since Britain handed governmental control of Hong Kong over to China in 1997, the island has existed somewhat peaceably alongside its northern neighbor under a system known as “One Country, Two Systems.” Hong Kong has remained relatively autonomous, and for years has elected its own government. Recent changes made by the central government in Beijing, however, have sparked massive protests as they threaten to erode the agreement between China and Hong Kong and place more and more decisions about life on the island under Chinese control. Most recently, on August 31, the Communist Party of China announced that candidates in Hong Kong elections would be chosen by a 1,200-person committee loyal to Beijing. Ideal contenders would need to “love China and love Hong Kong.” Though the news prompted outrage among many of the city’s residents, this week’s protests grew out of a much older pro-democracy movement. Protesters have coalesced around three primary demands: The resignation of the undemocratically elected Hong Kong Chief Executive C.Y. Leung, the resignation of Police Chief Tsang Wai-Hung over his treatment of arrested students, and “universal suffrage,” or free elections. Occupy Central with Love and Peace wasn’t just the name of one of the major organizations to have initiated the events, it was also the goal of an over year-long process intended to bring about universal suffrage by 2017. As illustrated by The Guardian, the past month’s events were the last of four stages announced by organizers in late March 2013: dialogue, deliberation, civil referendum and civil disobedience. Since its founding, Occupy Central with Love and Peace — the group’s full name — has grown incredibly. Arguably, it has been responsible for catalyzing the much broader pro-democracy movement evident in the streets of Hong Kong these past few weeks. The first public deliberation was held in June 2013 and drew nearly 600 people. The mass meetings discussed a range of options out of which the referendum would eventually emerge; the last deliberation day — nearly a year later in May 2014 — drew over 2,500 people. With deliberations ongoing, however, Occupy Central held its first voting reform referendum on January 1, 2014, which brought 62,196 Hong Kong residents to the polls. Unsurprisingly, 94 percent of voters chose a “civil nomination” process by which any candidate that collected a requisite amount of signature would have a spot on the ballot. The referendum vote kicked off a summer of intense protest by various groups within the pro-democracy movement. Half a million people marched through the streets of Hong Kong on July 1, that anniversary of the day in 1997 when the British handed over control of the island to China. Students — many of them organized within the Hong Kong Federation of Students, or HKFS — emerged as one of the movement’s most militant voices; following the march, 511 were arrested in the city’s financial district. High participation in and public support of the rally was seen as a positive testing ground for Occupy Central to begin planning mass civil disobedience. The National People’s Congress vote on August 31 to officially disallow open elections in Hong Kong all but assured Occupy Central would escalate. Writing for Waging Nonviolence last month, Elaine Yu said that it also provided a jolt to organizers at the beginning of the school year. When protesters announced in early September that they were resorting to civil disobedience, the group’s founders — Tai, Chan Kin Man and Chu Yiu-ming — shaved their heads to symbolize that they would make no concessions in negotiations with the government. Occupy Central’s flare for symbolism and mass politics was sometimes at odds with student leaders within HKFS and Scholarism, another organization of students who have been mobilizing around pro-democracy issues for the past two years. The same week as Occupy Central’s announcement, HKFS broadcasted that they would begin a boycott of classes on September 22. While the government’s announcement brought many pro-democracy groups together, tensions remained until the end of September. As Hong Kong resident Ariel Li explained in the Berkeley Journal of Sociology, students led a literal charge of 50,000 to Civic Square at the end of the five-day boycott on September 26. The confrontational move landed a number of student leaders in jail, and prompted the Hong Kong police to use pepper spray on protesters for the first time since the World Trade Organization Summit in 2005. Occupy Central members arrived the next morning as police carted off students and tens of thousands flooded the streets. Having initially hoped to begin their civil disobedience campaign later, Occupy Central met with students and decided to launch a joint occupation then and there as a means to capitalize on the momentum students had generated. HKFS and Scholarism pushed to occupy areas beyond Central, and bring the protest to the rest of the city. Numbers fluctuated until September 29, when another larger and more public round of pepper spraying by police brought widespread international attention, and prompted protesters to begin using the protection that would become the symbol of the pro-democracy movement: umbrellas. From that point forward, Occupy Central and the student groups’ exact role in protests has become more ambiguous, with many commenting that ordinary citizens have taken on the movement as their own. The established pro-democracy organizations generated the momentum that made the “Umbrella Revolution” possible. Notably, the protests of the past several weeks have remained almost entirely nonviolent — even “orderly” — throughout; a testament, perhaps, to the work of Occupy Central in circulating a clear framing around the use of civil disobedience and nonviolent discipline. Throughout the last week there have been protesters stationed elsewhere, but the occupation’s two main centers remain in Mong Kok and Admiralty, the much-photographed highway block in the heart of Hong Kong’s business district. Predominantly working class, Mong Kok is an important staging area for both clashes with police and the occupation’s second arm, given the visibility of students in the pro-democracy movement. Backlash from business elites isn’t entirely surprising. The 1,200-person committee designated to approve chief executive candidates in Hong Kong is comprised largely of business interests, many themselves loyal to Beijing. The end result of the protests remains unclear as students and other movement leaders were planning to embark on talks with the government today. Alexander Chow, secretary general of the HKFS, told the New York Times on Sunday that the federation would leave the talk immediately should the government make any attempt to forcefully remove the remaining protesters. However, it’s the government that has now decided to scrap the talks, with protesters pledging a new phase of civil disobedience to ensure that pressure continues to mount. No matter how it unfolds, one thing is clear: The years of work to make protests on that scale possible is an important case study for students of social movements and those looking to build them.